An Atlas V rocket launches the GOES-R weather satellite in November 2016. A similar launch of the GOES-S satellite remains on schedule for March 1 after the Air Force decided not to support a SpaceX Falcon 9 launch earlier the same day. CAPE CANAVERAL, Fla. — The U.S. Air Force has decided not go ahead with a proposal to support two launches from the Eastern Range in less than 24 hours this week, but officials say being able to do so remains a goal as part of efforts to support increased launch activity. The possibility of two launches taking place in one day from Cape Canaveral Air Force Station emerged earlier this week when SpaceX proposed to reschedule a delayed Falcon 9 launch of the Hispasat 30W-6 communications satellite for shortly after midnight Eastern time March 1. That would have been less than 17 hours before the previously scheduled launch of a United Launch Alliance Atlas V rocket carrying the GOES-S weather satellite at 5:02 p.m. EDT that day. While there was no formal announcement of plans to reschedule the Falcon 9 launch for March 1, it was under active consideration. The Federal Aviation Administration published on its website Feb. 27 a temporary flight restriction for airspace around Cape Canaveral that coincided with the time that Falcon 9 launch would have taken place March 1. However, the Air Force announced late Feb. 27 that the only launch scheduled for March 1 remained the Atlas 5 launch, with the Falcon 9 launch date still to be determined. "Range safety is the top priority, thus every launch requires the appropriate amount [of] analysis along with deliberate and disciplined discussions with the 45 SW team and key stakeholders," the 45th Space Wing, which operates the Eastern Range, said in a statement. 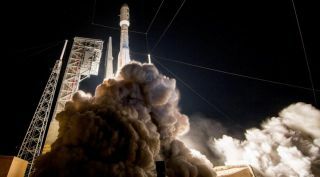 Industry sources said that the Air Force strongly considered allowing the back-to-back launches, but concluded there were too many open questions that could not be resolved in time to allow the Falcon 9 launch to take place so close to the Atlas V launch. That included concerns about potential exposure of the Atlas V on its pad to the Falcon 9 launch, taking place just a few kilometers away. "We were doing an initial assessment of being in an exposed condition," said Tim Dunn, NASA launch director for the GOES-S mission, during a pre-launch press conference at the Kennedy Space Center Feb. 27. "Obviously, we would need some time to take a look at that to assess all the risks that would be incurred on GOES-S as well as the Atlas V rocket." SpaceX had planned to launch the Falcon 9 early Feb. 25, but postponed the launch because of a fairing pressurization issue. The company said in a statement late Feb. 27 that the problem had been resolved and that it was awaiting a new launch date. The ability to support two launches within 24 hours is a goal of the 45th Space Wing's efforts to support higher launch demand from sites on the Eastern Range. The wing has been promoting an initiative called "Drive to 48" to be able to support 48 launches a year. That goal is based on average of one launch per week for 48 weeks, with two two-week maintenance periods. Part of that effort is being able to handle two launches in one day, said Air Force Col. Z. Walter Jackim, vice commander of the 45th Space Wing, during a luncheon speech at the 45th Space Congress here Feb. 27. "Right now we're looking at the capability of two launches in 24 hours," he said. "If we can constrain or reduce that time between launches, we're going to continue to open up launch opportunities for more customers to come in." To be able to handle two launches in under a day, Jackim said that at least one of the vehicles has to use new autonomous flight safety systems, which reduces the demands of tracking and communications assets at the range. SpaceX currently uses that system for the Falcon 9 and Falcon Heavy. "We have shown cases where we can do it, but one of the constraints is that right now one of the customers has to be flying on the autonomous flight safety system," he said. Jackim said the Air Force is studying other ways to improve the number of launches the spaceport can support, in part by addressing range and weather problems that can scrub launches. The Air Force is now using a new system to assess risks to ships that enter restricted waters during launch preparations, treating a tug with a two-person crew differently from a cruise ship with thousands on board. A new weather tool will allow controllers to better understand threats from lightning and other phenomena. He emphasized there’s no specific operational requirement to support two launches from the Eastern Range within 24 hours. "Right now, we’re just using the 2-in-24 as a goal. It’s kind of a strawman that we’re chasing to see if we can do it," he said.